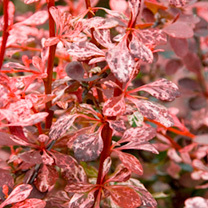 Berberis thunbergii f. atropurpurea 'Harlequin', also known as Japanese barberry 'Harlequin', belongs to the Berberidaceae family. It is a deciduous shrub with rounded deep purple leaves and some veriegation with the spots being cream or pink. It is also compact with small pale yellow flowers that turn to dark red berries. RHS Award of Garden Merit winner. Flowering time: May. Height 1-1.5m (3'3"-5'); spread 1.2m (4'). Supplied in a 2 litre pot.